For a long time, it looked like Moeen Ali was just a stop gap option for England and it was generally accepted that he would struggle to make it in the to the eleven once the selectors got their hands on a spin bowler. However, Ali has established himself as one of the team’s key all rounders and is currently ranked at number 4 in the ICC’s global all-rounder rankings in Tests. He has grown in stature as a cricketer over the past two years or so and has become an integral part of the England cricket team across formats. Ali’s disciplined spin bowling has grown from being fairly limited to that of a bowler who can be quite dangerous when the pitch offers assistance and as a batsman, he gives England the luxury of having an excellent batsman lower down the order. After all, he made his name as a batsman before he became the team’s primary spinner. So, let’s take put him under the Skanner and take a look at what makes him click and aspects of his game that can be exploited by the opposition. Adaptability is one quality that Ali possesses in abundance and is probably one of the biggest reasons why he has gone from a part time bowler to a frontline spinner in a Test team. He has graduated from being the quintessential ‘part time bowler’ to someone who is now expected to take wickets and that is down to Ali’s ability to adapt to the situation he found himself in, as regards to the England set up. He made the best of the hand that he had been dealt. So what makes him a good bowler? First and foremost, he appears mature enough to realise that he is a fairly limited off spinner and bowls within those limits, without trying out a hundred different things if things do not go his way. The penchant of trying too many things has been the undoing of many a spinner and Ali has never been guilty of that. That way he has minimised the risks of bowling poor deliveries. In addition to that, over the past year or so, he has improved his accuracy as regards to his length and the usual length that he bowls makes it hard for batsmen to step out in order to counter any spin. The length often creates doubts and that has often proven to be the most important factor in his bowling. As a batsman, Ali now needs to bat with the tail quite often or has to go for quick runs before a declaration. However, here again, he has shown his remarkable ability to adapt. Ali changed his game from that of a top order batsman to a lower middle order hustler with remarkable ease and added serious muscle to the English batting line up. He can score on both sides of the wicket and the fact that he is a natural stroke maker makes him perfectly suitable to his new role. 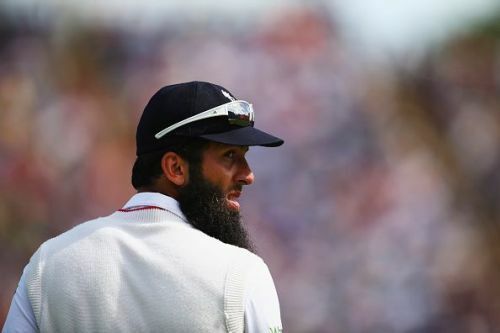 Like any other cricketer, Moeen Ali has his share of weaknesses as well both as a batsman and as a bowler that can be exploited by the opposition. As a bowler, his limitations as a bowler makes him rather ineffective in the 1st and that is something that has often proven to be a handicap for England. He has an an average of 50.65 in the 1st innings while it comes down dramatically to an impressive 27.19 in the 2nd innings. In addition to that, he takes a wicket roughly every 82 balls in the 1st innings while the same in the 2nd innings stands at a rather impressive 45.4. Such variance in effectiveness from one innings to the next is rather telling and is an indication that he is nothing more than a defensive bowler in the 1st innings of Test matches. The variance in performances, however, could be down to a lack of variations in his bowling arsenal and perhaps it is about time that Ali developed a few variations that he could call upon when he bowls on an unresponsive pitch in the first innings. Now, coming to his batting, it has long been suspected that he is a bit suspect against the short ball and his dismissal to such deliveries over the years has further reinforced that notion. Although it is true that he does not look cowed or intimated when facing short pitched stuff, it often appears that he struggles to decide how exactly he should respond to those. That said, it is a minor issue that can be solved quite easily. However, his role as the lower order all rounder has often made it mandatory for him to go for his strokes and that could one of the big reasons why he often plays shots that he shouldn’t.